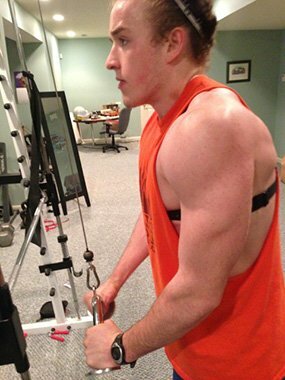 A serious back injury sidelined Joseph as a freshman while his football team got stronger in the weight room. See how this teen closed the gap and surpassed expectations! 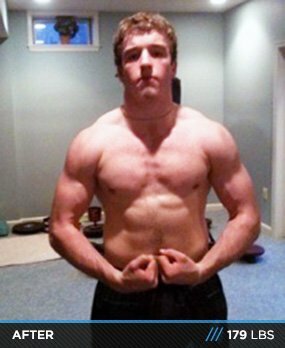 Going into high school, I was bigger than most guys, but I wasn't stronger than many. I suffered a serious back injury during the winter of freshman year which didn't help any. The rest of the football team lifted weights during the off-season and surpassed me in strength and size. When my back recovered and another football season came and went, I started lifting with the team during the off-season. I made slight size and strength gains, but nothing noticeable. At the end of spring during my sophomore year, I decided to do something about my strength. 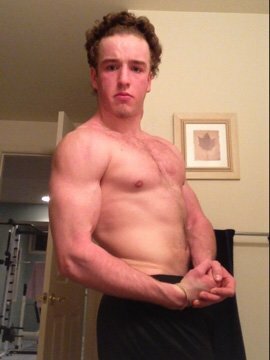 Six months later, my friends and family took notice of my transformation success. Now they ask me for advice on lifting and compliment my physique. I'm more confident, happy, and healthy now that I am 20 pounds leaner and more muscular. I went to Bodybuilding.com for supplements to support my efforts. I made a BodySpace account to track my progress and read articles about the most effective ways to build lean muscle and strength. I found many exercises online and began pounding the weights in the gym. After several weeks, I had noticeable size and strength gains. 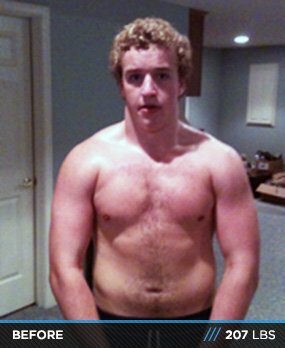 With the help of creatine powder that I ordered from Bodybuilding.com, my bench press went up 25 pounds and my arms looked bigger than ever. I continued lifting throughout the summer, but eventually hit a roadblock—the muscle I built was hidden under layers of fat. I was overweight at 207 pounds with 21 percent body fat. I started a vigorous fat loss plan at the start of school in September 2012, and after many fasted 6 a.m. runs and meal replacements, I steadily lost fat. I controlled my eating habits throughout the day and didn't eat as much. I only ate healthy, lean foods and did several hours of cardio per week to torch my fat stores. By November, I weighed 179.2, with 12 percent body fat. I had lost more than 25 pounds. I lost five pounds of muscle after an extreme cutting phase and started a bulking phase that I'm currently on. The hardest part of my transformation was the cutting phase. I desperately wanted to lose fat quick, so I put my body through extreme cardio workouts and controlled my eating. My inspiration came from the mirror. When I saw results, I couldn't keep myself out of the weight room. To lose fat, I only drank water and ate healthy foods like fruit, vegetables, and lean meats. To bulk, I followed a diet with excess calories and ate 5-6 times per day. My training regimen changed every few weeks to ensure my muscles didn't plateau. I hit my muscles from different angles with a variety of exercises to stimulate growth. Consistency and intensity were a big part of my training. I left the gym with my muscles twitching and sore. Dieting to lose fat was the hardest because I was often hungry. The thought of looking better with my shirt off motivated me to push through it. Drinking lots of water helped to keep me full. I plan to continue lifting weights for the rest of my life. It became a great hobby that keeps me healthy and fit. Working out is often the highlight of my day. Set a goal, research how to work out effectively, and learn to eat right. Don't quit when you don't see gains. Progress doesn't come overnight. Train hard. Some guys go to the gym and do arm curls with a few other exercises, but they barely break a sweat. You should leave the gym sore and sweaty. Have a spotter push you with forced reps and sleep a lot so you don't injure yourself by overtraining. Last, be consistent. Make a workout plan that's easy to track. Bodybuilding.com provided me with access to hundreds of articles on building muscle, losing fat, building meal plans, and tips on lifting. I was able to read and learn things that helped accelerate my transformation. Bodybuilding.com provided me with an organized system to track my progress with stats, pictures, and graphs. Seeing the progress I made week by week helped me keep pushing. Bodybuilding.com supplied me with top supplements for a good price with fast delivery. I gained insight on these supplements from articles, in-depth descriptions, and product guides on Bodybuilding.com. The huge online database of exercises available on Bodybuilding.com helped to diversify my training and detailed videos and descriptions helped me with correct form.